I have driven Alpines, Porsches and Ferraris. Audis, BMWs and Land Rovers. The list goes on. You name ’em, I’ve lived a life lucky enough to have got behind the wheel of ’em, with the slightly perplexing exception of a Lamborghini, the keys to which always elude me. I imagine your hearts are bleeding as you all reach for your violins. But (and I write this in the full knowledge that your eyebrows are about to soar up your forehead, shortly to tumble again as you conclude that I’m clutching a large paper envelope stuffed full of fivers) the first slot in my dream garage is now reserved for the Peugeot 5008. This is not a joke, nor some misguided attempt at humility, but in fact something I’ve been pondering for the past 7500 miles or so at the wheel. I am certain that I am right: the 5008 is – undisputedly – the most fundamentally capable, quietly joyous family transport that I’ve had the pleasure to run, buoyed both by its inherent capabilities and qualities and the fact that its badge carries no baggage. I’ll admit that when Peugeot’s styling folk announced they were reinventing their largest MPV as an SUV, I rolled my eyes – it sounded like a recipe for a car that fell into a gap between two clearly defined slots, or the sort of marketing sleight that makes my blood boil. Then I started noticing more and more 5008s on the road. And I liked what I saw. Design is, of course, subjective, but I reckon the 5008 is bestowed with a presence that makes it known without any need to be shouty. The details are many and varied, but if I had to pick one I think it would be the vertical slotted rear headlights, which are distinctive without veering into some of the blinking slot-machine kitschness that certain German marques mistake for looking premium (in my humble opinion). Inside, Peugeot’s design team ups its game again. It’s slightly ironic that as brand stable-mate DS fights to establish its interpretation of an upmarket but non-German look, Peugeot seems to be showing it the way – combining traditional materials with neat, non-leather touches. It is amazing just how much flourishes such as the fabric inserts lift the interior ambience. And what an interior it is in terms of flexibility and space too. The tape measure indicates that the Peugeot can be fractionally outpointed in some dimensions, but real life suggests that you never need more than it gives, even when we travelled either seven up, or stuck to four and threw everything we could lift into it. The individually sliding middle row of seats and floor bins below them stand out as clever touches. Our engine choice was spot on, too, even if it did take time and experience for me to believe it. A three-cylinder, 1.2-litre petrol engine pulling a seven-seater sounds ridiculous – and passengers who I would drop that piece of information on while they were in the car (I know, I know, my sparkling conversation needs work) would usually pull a face equally as ridiculous. It is smooth, refined and powerful enough, and while 34mpg doesn’t sound too special, it was certainly harmed by the majority of my miles being in thick urban traffic. It is, I think, the best small-capacity triple out there – and the auto ’box suited it too. Notably, I also think I’d choose this combination over what would have been a default diesel selection even as recently as a year ago. Yes, the latter would be considerably more economical, but the upfront price premium of around £1500 depending on discount would take a lot of miles and a seriously punchy resale value to recoup. And that is before you evaluate your environmental priorities. I’ll concede that the all-round driving experience is decent without being dazzling. Some enthusiasts might rail immediately at that, pointing out that no amount of positives should outweigh this humdrum verdict. I humbly remind them that this is a seven-seat SUV, and that there are plenty of supposedly sporty hatchbacks that fail to excite these days. Yes, there are cars that are as capable (the Skoda Kodiaq I ran before the 5008, for instance) and there are cars whose design can also lift your mood (any Land Rover), but none combines both facets in a package that is as affordable and jaunty as this. There is no better Peugeot, and I struggle to think of any other vehicle – the supposedly ‘perfectly pitched’ Golf included – that nails the upper end of aspirational mainstream car ownership so well. So, pole position in my dream garage? Why not? I’ve always believed that the first answer to that question should be a car that can do everything, so it gives you permission to buy others that merely do some things. The person who quickly responds by saying ‘Ferrari 458 Speciale’ might be very wise indeed… right up until the point they take their family on holiday. You get my point, I’m sure – and, yes, my second car would be an Alpine A110. But there’s no need to fit life around the 5008, because it slots into it so perfectly. Live with the 5008 for a bit and you soon get the sense that you’re going to miss it when it’s gone. It just makes life easy. So much so that I took this one round to a friend in need of such a car for a nose around. He promptly bought one. Engine Who knew a 126bhp three-pot, 1.2 petrol could pull a seven-seat SUV along so smoothly and effectively? Steering wheel squeak Hard lock resulted in a strange squeaking noise that disappeared after a few weeks. Was it the cold? How much should you forgive a car? Or, perhaps more pertinent, how much should you forgive a car that’s just six months old? I pose this question because the 5008 has developed a squeak – or maybe a subdued roar – between the steering wheel and the steering column. Wind on a lot of lock quickly and it makes a sound that is either like a mouse that’s got the cheese or the young offspring of Chewbacca learning to roar, depending on your point of view. It kept us amused for a while, trying to think of how to describe the noise in print. Foolishly, a little bit of me hoped the fact that its arrival had coincided with the cold snap was somehow relevant, and that it would pass. I suppose it has been either cold or very cold these past few weeks, but alas even the balmiest of winter’s day has made no difference. My mileage is just more than average, at nearly 7500 in six months, but I don’t see this as a valid excuse. So how annoyed should I be? I’ve bought white goods that have squeaked from day one and learned to ignore the issue. But, by the same token, I once bought an expensive washing machine whose makers were so determined to justify its premium that they were happy to send someone round to fix it for free nine years after it first arrived. That’s a lot of spin cycles, although I guess a steering wheel does more. The answer may lie in working out just how significant an issue this is. Do I break out the WD40 and attempt a self-fix of what might be the most trivial of lubrication issues, or do I follow the letter of the law and take a few hours out to visit my nearest dealer lest something altogether more sinister be happening under the cowling? Whatever I conclude, it is, of course, a great pity that anything has gone wrong, however minor. Peugeot’s reliability record was once the source of many a desperate, smacked hand on face, and the Reliability Survey of our sibling title What Car? offers few glimmers of hope. But what’s clear is that it has improved on the latest generation of models such as this. It is occasions like this that remind me why Toyota sold so many cars even when its model line-up was so uninspiring (which is not the case now, may I stress before the phone rings). Car enthusiasts though we are, and thereby more likely to forgive the odd foible or overlook deficiencies, regarding them as characterful (an affliction that pretty much sums up all my love for the new Suzuki Jimny), there is nothing more infuriating for the average car owner than a reliability or quality issue. The deal when you buy a new car is, not unreasonably, that it runs faultlessly for at least three years. That said, the car I drove before this, a Skoda Kodiaq, born from the Teutonic womb of the supposedly quality-obsessed Volkswagen Group, actually did leave me stranded, when the battery gave up the ghost after a succession of short journeys. Nor was that incident a one-off. Back then, I’d have swapped a squeaky steering boss for having to catch the bus on a couple of cold, dark nights, that’s for sure. Stand by for an update: perhaps the fix can offer some perspective. Inside Job If there’s a more characterful yet classy interior than this in the MPV world, drop me a line. Shrunken glovebox Right-hand-drive conversion means a tiny glovebox. It’s an all too visible sign of cost saving. The 5008 is an ergonomic delight… in most ways. The seats are supportive and it’s easy to get comfortable. All the switches are intuitive. I usually hate touchscreens but Peugeot’s is decent enough. But the placement of the USB socket at the back of a dark, cavernous cubby is beyond frustrating. It’s a small issue but a constant source of irritation. It is now significantly more than a year since the 5008 went on sale in the UK, fighting for sales in one of the most hotly contested and fastest-growing sectors, yet there’s no rival I can think of at this price that betters its versatility, practicality and character. In an industry that never stands still, the Peugeot’s enduring appeal is setting it apart. Tis the season to be jolly. Tra-la-la-la-lah, deck the halls and raise a glass to my namesake (alas, not relative, given the royalties presumably pouring in right now) Noddy Holder, famed singer of 1970s supergroup Slade, notable for hits including Merry Xmas Everybody. But for all this bonhomie, there is something that kills my Christmas cheer quicker than discovering someone has forgotten to put the nutmeg in the egg-nog: the potentially quite ruinous journey to collect the Christmas tree. While your mind may be racing ahead and wondering what risks could possibly be involved in such a mundane task, it is only the journey to and from wherever we buy the tree to which I’m referring. The issues, of course, revolve around the needles. On reflection, there is a hint in their name as to their potential for jeopardy, although it is not only their propensity for jabbing you in the face that needs addressing. For starters, collecting the tree tends to be a family event. So that’s both the front and two of the middle seats spoken for. Add in the tree and this brings its challenges, albeit ones that highlight once again that the Peugeot is a cut above a lot of the opposition. Rearmost seats down, it has 822 litres of space, versus the Skoda Kodiaq’s 720. That’s a decent advantage – and above average for the class – but it’s still not enough for anything more than the most pathetic of trees, the likes of which are never going to be signed off once your overexcited kids realise they can put the angel in place simply by standing on their tiptoes. What to do? Well, the 5008’s middle row of seats splits 40:20:40, leaving you with two options, the most practical of which is to drop the middle seat and substantially expand your load length. Yes, the kids will likely injure themselves on the aforementioned needles and rapidly become unruly as a result, but the threat of their displeasure turning into an argument is greatly reduced because of the spike-covered tree trunk that separates them. But if you favour happiness over practicality, by far the best option is to tell your ‘other half’ to go shopping and catch the bus home when she’s done with buying socks. Not only is this better for her mood, but it also gives you a chance to shuffle the kids next to each other, drop one of the side seats in the middle row and fold the front passenger seat flat (a neat trick that is increasingly an option on cars with an eye on practicality). Behold, the 10ft tree that you and the kids really wanted all along can be yours. Hooray for the commodious Peugeot and its clever seats. However, as sure as a fun-packed Christmas lunch is followed by the Queen’s speech and a 20-year old Bond film, so there must be some words of caution in this homage to the 5008’s load-carrying capabilities – and again it relates to those needles. Someone will write in and say that age and experience should have taught me what’s to come after you have had a Christmas tree in your car but, well, you do it only once a year and, yes, I have the memory of a goldfish. As such, I never, ever remember to take a sheet or some-such on which to lie the tree. And, as a result, I always end up with a car full of needles, which will both pierce my trousers and litter the car for months to come. The 5008 offers little protection, the boot covering being no more than a flimsy, carpet-covered folding base that lets itself down both by grabbing needles into its weave so they won’t vacuum up and by displacing easily from its covering duties so the needles fall into the underfloor storage area where the seats stow. Once there, they are nigh-on impossible to liberate from the nooks and crannies that lie below, remaining like the relative who won’t go home. Three-pot marvel The 1.2-litre triple continues to be a revelation for how it delivers enough power in a smooth and refined manner. Touchscreen bias I’m still in two minds about the effectiveness – and thereby safety – of predominantly touchscreenbased control systems. Advancing technology is going to change the car more in the next 10 years than the past 100, we are told. But I defy the geeks to come up with something more effective than the old-world system Peugeot employs to raise and lower the boot-mounted rearmost seats. You tug on a fabric cord to raise the seat and pull on another one to lower it. Simple. How do you find out if a car has stand-out design? Park it in a huge car park, forget to look at the helpful signs reminding you where you parked and then return a few hours later. You might think a brown SUV would blend in, but thanks to the chrome roof rails and lower door accents, finding it was the work of moments. Once upon a time, I clung on to the belief that it didn’t matter how an MPV drove, so long as it delivered men, women and children, plus the occasional dog or wardrobe, from point to point as easily as possible. Then I drove a Ford S-Max. For while it’s true that how an MPV drives is less of a priority than for your regular hatchback buyer, it is amazing the difference being in a dynamically decent car makes. The mundane drive becomes enjoyable, challenging surfaces an aside and the very worst of our roads need raise no more than a quizzical eyebrow. The difficulty is that you tend to get used to the positives, and set them as your minimum benchmark. What a car does well is taken for granted, and anything that aims at the same mindset but falls below that standard is a disappointment. Now, as I move on to the Peugeot 5008, you might rush to remind me that it is definitely, absolutely not an MPV. Peugeot has gone to massive lengths to stress its metamorphosis from people carrier to sports utility vehicle. 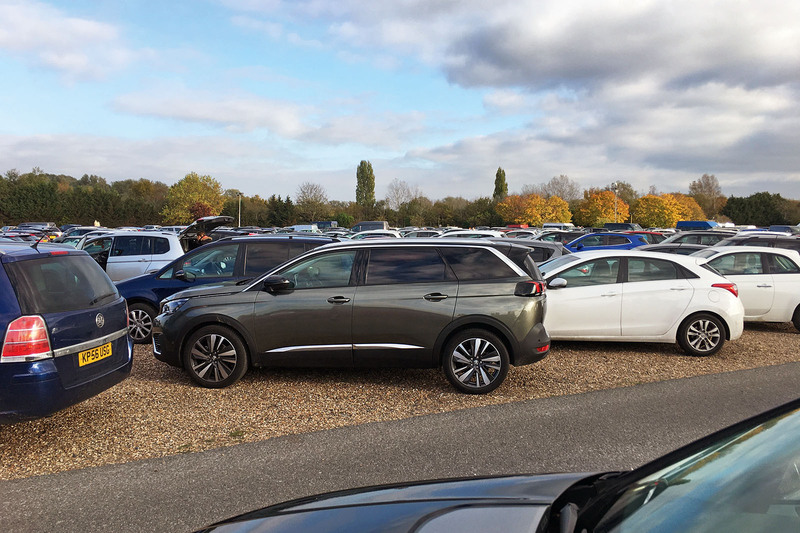 So, even though the term multiple-purpose vehicle (MPV) might well apply to either genre, Peugeot is absolutely certain that the 5008 is an on-trend SUV. And so the pressure ramps up, because I’d argue that, in that philosophical shift, there’s an added imperative to make the car better to drive. The S of SUV stands for sports, after all, and while I’m (just about) clever enough to realise Lotus won’t be rushing to recalibrate the Evora after a spin in the 5008, that S-Max benchmark still looms large in my mind. To meet its brief, the 5008 has to be dynamically engaging. Now, almost 4000 miles in, I’d say the 5008 delivers something that is satisfactory without ever bringing any of the sizzle that the very best drivers do, despite the best efforts of the smaller than average steering wheel delivering some directness to the experience. And – sound the klaxon – it is particularly key that you don’t upgrade your wheels to the 19in options if you want it to retain composure at all times. On a smooth road surface it is absolutely at its best, delivering close body control and pliancy while satisfactorily insulating you and your friends from the worst effects of tyre roar and wind noise. For long motorway journeys that’s just perfect, but throw in some bigger bumps, an irregular road surface or a combination of corners and that composure is challenged. That makes hustling the 5008 an unlikely pastime, even if it does grip surprisingly well for such a tall car. Nor does the Sport toggle add anything to the mix, offering no more than increased engine noise and perkier throttle response. But does any of this leave me not wanting to recommend the 5008? Even in Autocar, home to the car enthusiast, no. There are better SUVs (and, hush, MPVs) to drive, but only marginally so. The shortcomings are there, but never strongly enough to unravel the compelling case built up by myriad positives for this car. ROBUST FURNISHINGS The elegant, characterful interior is withstanding the worst that the kids are throwing at it, from crumbs to spillages. NAVIGATING NAVIGATION The sat-nav is very good, but functions including postcode input could be more easily found. Whenever I talk about the 5008, the proverbial elephant comes marching straight into the room. Eyes tighten. Eyebrows raise. Disbelief spills out. So let’s get it out there in the open here and now, so the elephant can get back to where it belongs. Yes, the 5008 is a seven-seat SUV and, yes, it is powered by a three-cylinder 1199cc petrol engine. I’ll accept the numbers do little to dispel the awkward glances and shuffling from toe to toe. Peaks of 131bhp and 170lb ft do not set the pulse racing. A 0-62mph time of 10.4sec might even lead you to wonder what this car is doing in Autocar. The point being, of course, that the engine, diminutive though it may be, complements the car perfectly. I write that with absolute confidence because, in the past month, I’ve driven the 5008 about 2500 miles. I’ve enjoyed everything from town commutes to seven-up 75-mile round trips to 250-mile runs fully laden with the family. All on a variety of motorway, A-road, B-road and whatever comes next in line down the food chain in the piddling lanes of Devon and Pembrokeshire. Not once – not even fully laden and pulling out from a standstill with a large truck bearing down – have I wanted for performance, or had to modify my usual driving behaviour. With shifts governed by the six-speed auto, it’s a slick, capable performer that mixes with the flow of traffic without any more compromise than a mild intrusion of noise on the rare occasions that you push it beyond about 2200rpm. This is a truly special powertrain – and more than good enough to banish for ever the need to add the caveat “…for a three-cylinder” when talking about it. In this area at least, Peugeot (and Citroën) may well have developed a unit that is industry-leading, although the folk at Ford might quibble. The one lingering concern I had when taking collection of the car was around fuel economy. As diesel has been demonised over the past year or so, it has become apparent that a large proportion of car buyers have gone on-trend and bought a petrol car, only to discover that what they bought doesn’t cover the number of miles to the gallon they hoped for. Which, of course, is both inevitable and why diesel makes so much sense in certain circumstances. If I’m honest, not so long ago my default advice to any seven-seat SUV buyer planning to cover many out-of-town miles would have been to buy diesel. Now I’m not so sure – although the financial equation still hinges on just how many miles you cover (and the emotive one on which pollutant, NOx or CO2, you are most concerned about). This 5008 is averaging 33.0mpg. I don’t have an equivalent diesel comparison (having not driven one as many miles, in the same way) but I do know that, over 12,000 miles in a diesel Skoda Kodiaq, I averaged 39.7mpg. Very roughly, that means that every mile in the 5008 is costing me around three pence more in fuel than Skoda’s diesel. While that sounds like it could add up, a comparison of this petrol 5008 and the equivalent 1.5 HDi diesel list prices and discounts suggest a £1500 premium for the latter – a difference that I’d need to drive 50,000 miles to pay off. The difference if you choose to lease, however, is much slighter, because there appear to be some very enticing offers on the diesel out there at the moment. That suggests there are dealers keen to offload the diesels in the current climate, or that there is a greater confidence in the resale values of diesel versions of the car. Given the uncertainty, it is also possible that both could apply. The conclusion I’d draw is that it’s a fluctuating market, and that the answer may change at any given time. But on experience so far, if you plump for this petrol-engined 5008, you won’t be disappointed. AUTOMATIC TRANSMISSION Some say you should save money and opt for the manual. I reckon the auto makes the driving experience seamless. EAR-PIERCING ALERTS Dare to step from the 5008 with the key still in the ignition and the ensuing audible alert is loud enough to wake the neighbours. Is there a smaller glovebox than the 5008’s? Presumably as a result of taking the path of least resistance for the conversion to right-hand drive, there is just enough room for the ownership manuals plus, maybe, an actual pair of gloves. The unusually deep and long central storage unit compensates. It’s also air-conditioned, so the salad in your sandwiches stays crisp. I’m a big fan of underfloor storage in cars: it’s out of sight and therefore more secure, it is still accessible and oddments can be packed in so that they don’t rattle around. Full marks to the Peugeot 5008, which features several commodious hideaways and cubbies, living up to its carry-anything family brief. They say you should take your time to fall in love – but, around 30 seconds after settling into the driver’s seat of the Peugeot 5008, I was smitten. And, before you write in, I know that sounds an odd thing to say about any car, let alone a Peugeot, but it is absolutely true. It is because this 5008’s cabin is a joy to be in and look at. Everything that you first see and touch is not only great in terms of perceived quality but interesting too. There’s the dark faux-denim cloth that breaks up the plastic surfaces. The digital dash display. The ‘piano keys’ that operate the infotainment functions. The gearlever for the auto ’box, which looks and feels designed, rather than just plonked in. I could go on. It’s pleasing, too, that this Allure trim is just one step up the four-strong range, which starts with Active and ends with GT Line and GT. It is described by its maker as “the ultimate in understated luxury” and, while that statement is (inevitably) laden with a touch of marketing hyperbole, I’m struggling to think of a mainstream family car that looks better inside or out. Styling features include tinted rear windows, trim enhancements and additional chrome flourishes. All of them look good. Throw in the extra kit it adds too, including a rear-view parking camera, upgraded sat-nav and various driver assistance systems, and it makes for a highly competitive proposition. This is a large seven-seat SUV that retails from well below £30,000 even with the cosmetic extras – and one which our sister title whatcar.com can already secure you 7-10% discounts on through its New Car Buying service, such is the competition for sales in this sector. Even so, some context might be needed to fully explain my excited reaction. The Skoda Kodiaq from which I stepped was many great things, but its interior was as rigorously functional as the Peugeot’s is interesting. Both work in their own way, but inevitably my reaction was exaggerated by the contrast. Already, you’ll start to understand why the chance to live with these two seven-seaters back-to-back is going to be such a fascinating test. Consequently, I’ll confront one of the prejudices that is flitting through your mind now (I know you’re thinking it because it popped into my head) – namely, that my joyous reaction to getting into the 5008 is going to be short-lived, because Peugeot means French, which means style over substance and flaky build quality. Skoda, meanwhile, means Volkswagen, which means German build quality. Sorry, but I don’t buy it. Stereotypes are usually rooted in fact but also tend to last long beyond them being factually accurate. While the Skoda was largely trouble-free, I did have an issue with the battery that left me stranded more than once. Every Peugeot I’ve driven in the past five years – including a year spent in a 308 SW, which I found to be a very fine if not quite class-leading car – has been trouble-free. Ownership surveys provide a more mixed view; in most, Skoda outperforms Peugeot. I am a sample size of one but, rather than leap to conclusions, let’s see how this test goes. Nor is it just the cabin ambience that has won me over, although it is the standout surprise from my first few weeks in the car. As you might hope in a large SUV, the cabin is spacious and well laid out. The kids, so often hard to please, piped up without prompting how comfortable they are in both the rearmost and middle rows of seats. The tape measure suggests they are right. The engine, too, is a surprise, although in the sense that it remains a critical point of interest. You don’t need to be that old to look at a seven-seat SUV powered by a 1.2-litre engine to think that it is a combination that will never work. The world has, of course, moved on, and what’s evident already in these first few hundred miles is that it works just fine: linked with the auto ’box, it’s smooth and capable enough, and the 10.4sec 0-62mph time isn’t so pedestrian as to be a nuisance. The question marks are around what cost this has on fuel economy, occasionally refinement and the linearity of acceleration. Unladen and around town, 40mpg looks possible, but out on faster roads the concern is that it has quite a thirst. More testing will answer that particular question. To drive, the 5008 has been decent, if not startling. The deliberately small steering wheel takes some getting used to but, thanks to my height, doesn’t obscure the dash (for normally proportioned people it could) and actually forces you to adopt an interesting, wristy steering style. In terms of engagement with the road, there’s little, but that’s the norm these days, while the ride seems mostly decent, only turning brittle and unsettled on the most broken of surfaces. These are the chief criticisms that held it back from scoring more than a (still strong) 3.5 stars in its Autocar road test, but my suspicion is that when the destination is 200 miles away and the wife, kids and luggage are on board, it may not be my first priority. Again, we’ll see, because no Autocar reader is going to thank me for recommending a car for its ambience and practicality alone. An intriguing six months lie ahead, then. The latest car launched by a marque should always be its best, but already I suspect this 5008 could be the firm’s very best in many years. On first acquaintance – a 200-mile motorway and B-road drive – there was lots to love about the 5008. But I couldn’t help having half an eye on the fuel meter for this low-capacity petrol car. It was dropping at a faster rate than my diesel-dominated life has come to expect. "These are the chief criticisms that held it back from scoring more than a (still strong) 3.5 stars in its Autocar road test, but my suspicion is that when the destination is 200 miles away and the wife, kids and luggage are on board, it may not be my first priority. Again, we’ll see, because no Autocar reader is going to thank me for recommending a car for its ambience and practicality alone." I would, especially on SUVs & MPVs. And I wish more manufacturers (and auto journos) would consider these before Nurburgring-beating-abilities. Twenty years ago I had a Ford Orion , three Kids and the wife, a full size Buggy for the youngest (2 yrs old) luggage for a Week, all of it fitted in the Boot, it went in just, and there was a Child Seat in the Car back Seat, today kids have far to much stuff, blame most of it on marketing the must have accessories, a theory is if you have more room you’ll back stuff just because you can just in case, I’m flabbergasted at the price of stuff for kids today, the Merida, that had a major recall last year I think(?) going on fire I think, that wouldn’t entice People to buy one new or used. We all swear by certain makes usually because we’ve had no majors with them,but other pillary them just because they don’t like, well, my stock comment for that is their money their choice, the 5008 , really, unless you’ve not been careful or want a large Family, but as the case is now, most of the time they’re driven one up. Lower it by 100 mm, fit a six (or at least a 2.0+ L turbo four) and I'd buy one. Second hand, at least. Had one of these in Scotland for 10 days and was very impressed. Interior is not only good to look at but very functional. The car has plenty of room and the back row of seats can be used by an adult for short journeys. The handling and wind noise of the car was good for it's size. Compared with a full-on SUV the sound insulation was great with the only slight negative being the ride on some B-roads. Overall though was a great car. I have a Mazda 5 and being disappointed with the standard 2.0 petrol engine I swapped it for a 2.5 petrol engine and gearbox (from a Mazda 6 Sport). That's because I wanted to take 6 people and a roof box to Croatia and back. Six years later I still have the car and am convinced for that sort of usage (9,000 miles a year with foreign holidays) ) it needs an engine that big, even if I only get around 32 mpg without the roof box fitted. Whilst I am sure that a 5008 1.2 works on shorter trips I would be interested to see it taken to Marbella or a similar location with a full load. Peugeot should probably offer a bigger engine as an option for that sort of usage but i suppose they are concerned that too many would buy it without the need. Peugeot should probably offer a bigger engine as an option for that sort of usage but i suppose they are concerned that too many would buy it without the need. They are introducing a 1.6l Pure Tech (petrol) 181HP with 8-speed EAT auto from October 2018 build, alongside the 2.0l diesel engines already offered. Can’t the speedo and rev counter be seen by the short and the tall?, looks as if the steering wheel gets in the way...? ... and I was very impressed with the amount of pull he was getting out of a 1.2l engine. It cruised effortlessly down the motorways at speed without feeling like it was trying and there were plenty of great gadgets on board. In particular I liked all the parking aids, for a car it’s size the top-down parking cameras and rear camera made squeezing it into tight car park spaces look effortless.